We are going to show you how to keep your query parameters when you run a split test on Convertize. When someone visits your site, the parameters contain useful data about them such as where they have arrived from. For example, in: www.convertize.io?utm_medium=email, the parameter in bold indicates the user arrived from an email. 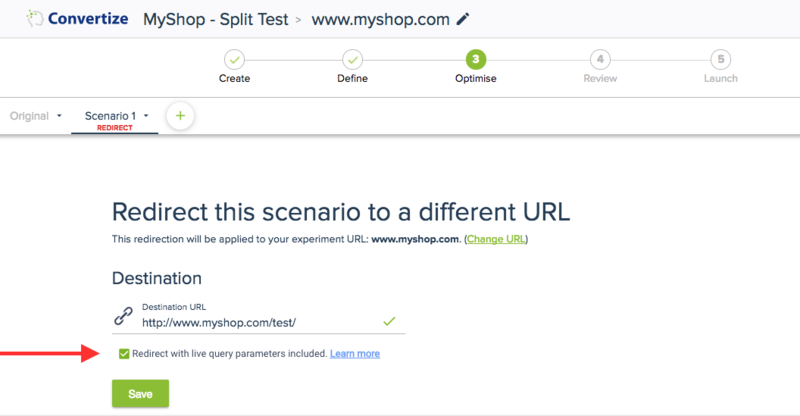 When you run the experiment and visitors to the first URL are forwarded to the second URL, the attached parameters are lost. This may cause a problem. If we imagine that you have been running an email campaign that promises your mailing list 10% off if they click a link, those that are redirected won’t have the parameter ?utm_medium=email. As a result, your website won’t offer them the promised discount. How do I keep query parameters when split testing? As you can see, the ‘Destination URL’ is the variation you will redirect part of your traffic to from the original page. In order to preserve the live query parameters, you simply have to tick the box underneath the Destination URL.